The Diamond XtremeSound XS51 Sound Card is absolutely an audiophile's delight. The Diamond XtremeSound XS51 Sound Card adds a cinematic effect on your everyday computer audio experience without the need for extra space. This 5.1 Channel sound card features Audacity, which records live audio through various sources, giving you total audio enjoyment. 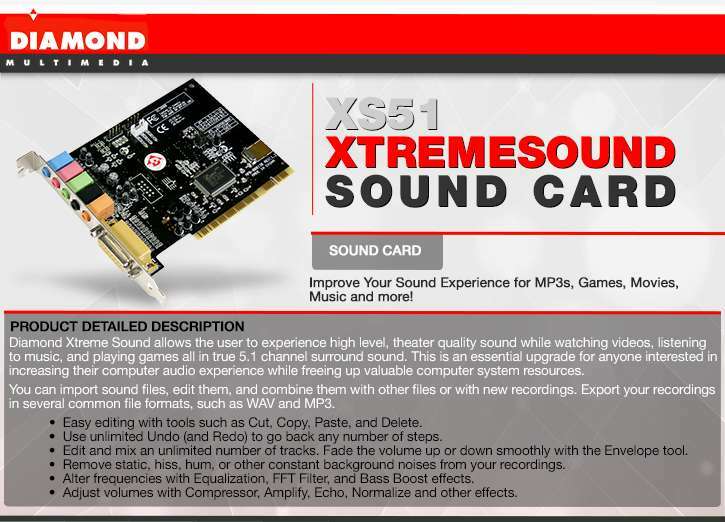 Purchase the Diamond XtremeSound XS51 Sound Card right away!